There are certain flavor combinations that just hit the spot – especially in the fall and winter months! 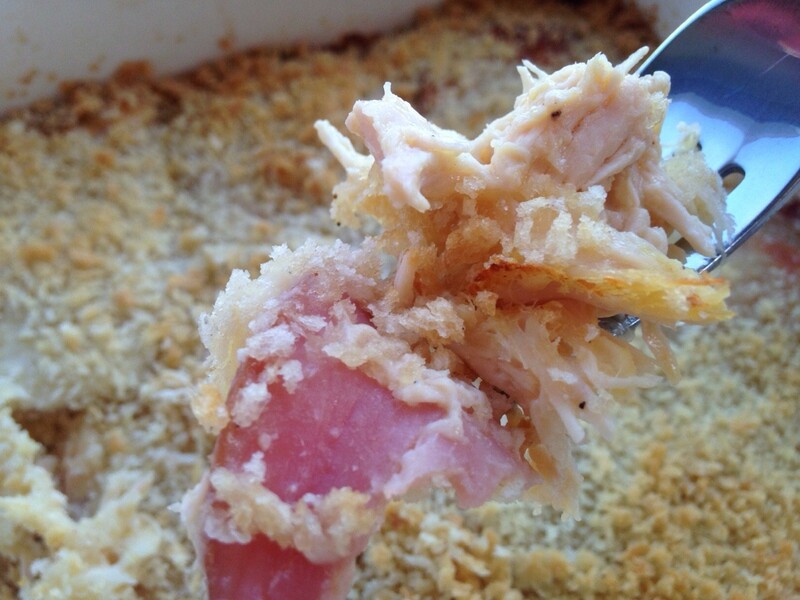 We crave food and meals that are comforting and filling, and this Chicken Cordon Bleu casserole is the perfect fit. This casserole is layered with tender chicken, pieces of flavorful Canadian bacon, creamy swiss cheese and a crunchy panko topping. I made this the other night for dinner and it was so rich and filling my husband had a hard time finishing his second portion. Another great addition to this would be cooked chopped broccoli layered between the chicken and Canadian bacon… What a great way to sneak in some veggies, lol. Chicken is a great source of protein, but can get really boring after a while so having meals like this or Chipotle Chicken Meatballs, Honey Garlic Chicken, or Italian Chicken Bake are perfect to stay on track while also being delicious! To make the chicken, pour soup and 1 can of water into the crock pot and stir to mix. Add chicken breast, cover and cook on LOW for 6-7 hours or HIGH for 3-4 hours. When the chicken is done take out and shred, place into a bowl and season with salt and pepper. Set aside. Preheat oven to 375°. Spray a 13×9 pan with cooking spray. To start layering the casserole, add chicken on the bottom layer and spread evenly. Take diced Canadian bacon and sprinkle evenly over the chicken. Then layer the cheese slices evenly over the Canadian bacon. Top with panko, spray with cooking spray cover with foil and place in the oven for 30 minutes. Take off the foil and cook for another 10 minutes. Remove from the oven, cut into 6 equal pieces and scoop out into bowls and serve. Serving Size: 1/6 of the pan approx.